Love the Smurfs as much as we do? In fact, I’ve never seen such a big collection in one place! You can select from Twin, Full, Queen, and King sets. Each set includes 2 pillowcases, a flat sheet, and a duvet cover. Right now they are all on special for between 55% and 65% off, but I am not sure how long that will last. Visit Beddinginn to see the entire selection. That’s the Vexy Costume for kids. It comes in sizes Small, Medium, and Large (which goes up to a 14) and includes the top, pants, shoe covers, belt, and headpiece. That’s pretty much all you need! “The outfit features what this character looked like throughout the whole film. It comes with a pink and burgundy striped top with beige sleeves. The skirt is a velvet material in purple and has a black lace hem. 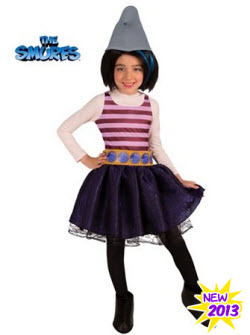 The belt is gold with blue designs and her grey hat is included as well.” I’m most excited that it is reasonably priced ($21.99 right now at Costume Supercenter.) You could even add just a touch of blue hairspray, which they sell for only $2.99. The Women’s Costume comes in Standard Size, which is up to a 12. It includes the top, pants with attached shoe covers, belt, and headpiece. Even it is not too expensive compared to most adult costumes at $32.99. Smurf costumes are hot this year and Vexy will likely sell out because it is brand new. Get together a whole group and go as a bunch of different Smurfs! Did you hear about the new Smurf Halloween movie? 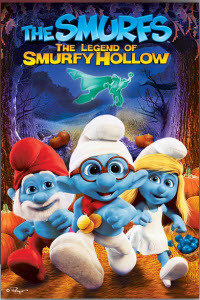 It’s called “The Smurfs: The Legend of Smurfy Hollow.” Obviously it is a takeoff on the Legend of Sleepy Hollow, a perennial Halloween Favorite that has also been done by Disney and many other companies. One of the interesting things about the movie is that it is not all the old cartoon style but rather part new CGI and part animation. It also has the voices from the new movies. The movie is short at only 22 minutes, but that is typical for this type of holiday special. At only $5 for the DVD on Amazon, that isn’t too bad. Have you seen The Smurfs: The Legend of Smurfy Hollow yet? With the release of the second Smurfs movie quickly approaching, I’ve been seeing some really cute Smurf shirts! You can find them in both kid sizes and adult sizes. The “adult” and kid Smurf shirts can be quite different! You’ll find every character from Gargamel to Papa to Grouchy to Brainy. And of course, Smurfette. No one could forget Smurfette! Click through and check out some of the Smurf shirts below from Stylin Online. They have one of the best collections with over 70 different Smurf items. Build-a-Bear has announced a new line of Smurf products just in time for the Smurfs 2 movie release. 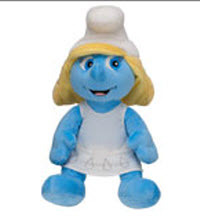 The new Smurf characters Vexy and Hackus will be joining Smurfette in the line of plush toys. In addition, they are running a contest where you can win a $50 Build-a-Bear gift card. Simply take a picture of your Smurfs plush from Build-A-Bear and share it on Instagram with the hashtag #IlovemySmurf. Five winners will be chosen from July 12- July 21. The Smurf line is available for a limited time at your Build-a-Bear Workshop as well as online. When you click on the category of cards, it will open up several cards that fit that category. For example in the the “Thinking of You” Category you can get one with Grouchy Smurf that says “Thinking of you makes me less Grouchy.” Each card has the saying, an image, and the name of the smurf featured. Once you choose a card you can personalize the “To” and “From” lines and then either have it emailed or download it so that you can print it. Visit the Smurf Happens website for more information. We’re not surprised to see information about the release of a Smurfs 2 Video Game. Once again Ubisoft will be producing the game and it will be available for Xbox 360, PlayStation 3, Wii, and Wii U. An “interactive storytelling book and collection of mini-games” will be available for Nintendo DS. The game can be played by up to 4 players at the same time as well as a 5th player on Wii U. The game will span 30 levels across 6 different worlds and will include the “Naughties” from the 2nd Smurf movie. The game will be available in July. You can check out the official game video below. The Smurfs DVD will be available by Christmas! This is great news for all of the Smurfs fans out there who were hoping to give (or get) the DVD as a gift this season. There are a few different options depending on how much you want to spend. Amazon is taking pre-orders for all of them right now. The most basic is the Smurf DVD for $16.99. 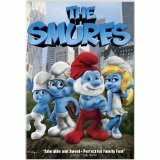 The Smurfs Blu-ray 3D/DVD Two-Disc Combo is $27.99. Most interesting is a 3 Disc set that includes both the Blu-ray, the DVD, and another DVD of The Smurfs: Christmas Carol. It sells for $24.99. Some of the extras that are included are Meet the Cast, a music montage, a couple of games, and deleted and extended scenes. All 3 versions will be released on December 2, 2011, and you can pre-order any of them through Amazon with their pre-order price guarantee as well as free super saver shipping when you spend over $25. Smurfette costumes are going to be one of the most popular this Halloween season and we figured out how to get them on sale! 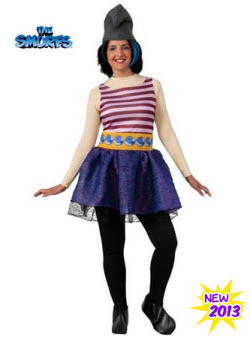 BuyCostumes.com has the Smurfette Adult costume, adult wig, and infant/toddler costume. You can save 10% on any order of $40 or more through Halloween with code Hallow10. You can also buy one item and get 20% off the second with code BOGO20. The choice is yours! Includes: Wig. 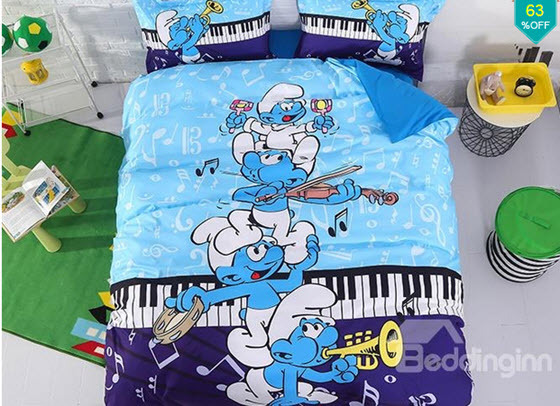 This is an officially licensed The Smurfs product. Includes romper and headpiece. This is an officially licensed The Smurfs costume. Includes: Top, pants and headpiece. Does not include shoes. This is an officially licensed The Smurfs Costume. Ready to throw a Smurf party? You are going to need some Smurf party supplies! Birthday Express has a really cute line that includes everything from plates, cups and napkins to balloons, stickers, hats, and centerpieces. They also have Smurf invitations and Smurf thank you cards to take the party from start to finish. Not all of the Smurf party supplies are currently in stock but as we get closer to the release of the movie, I am sure that we will see more of them. Visit Birthday Express to see the entire line of Smurf party supplies. Some of our favorites are shown below.